Putzmeister celebrates 60 years of innovation with a finely graduated range of products in the fields of concrete, mortar, tunnel and industrial technology. Putzmeister has proven to be a successful, innovative and internationally oriented manufacturer of construction machines for 60 years. The merger with Sany Heavy Industries Co. Ltd. in 2012 marked a milestone for a strong partnership, which now continues to grow steadily. Over the years, Putzmeister has developed strongly in the concrete, mortar, industrial and substrate technology sectors. Mobile belt conveyor systems and project-based solutions for precasting works complete the Putzmeister portfolio. Groundbreaking machine technology and outstanding availability combined with an extensive sales network and added benefits with regard to both safety and service — these factors are what set Putzmeister apart, according to the company. From the outset, Karl Schlecht, the founder of Putzmeister, stuck to a principle. For him, contact with the customer did not end upon delivery of the machine but also was maintained in the years and decades following delivery. Closeness to the customers requires a dense and well-structured sales and service network. Putzmeister began establishing its own branches in Germany as early as the 1960s, with sites in Munich, Essen, Hamburg, Frankfurt and later also Berlin and Gera. In the 1970s, the company added subsidiaries and sales offices in other countries — including France, Spain, United Kingdom, United States of America, Brazil, South Africa, Singapore, China, Korea, Japan, Russia, India, United Arab Emirates, Iraq and Turkey — enabling Putzmeister to act internationally. Furthermore, the Putzmeister sales team is supported by well-trained dealers and services centers around the world. With the development of a practical mortar pump (1958), the first continuous mixing pump for gypsum plaster (1965), and a compressed air-based screed conveyor (1965), Schlecht revolutionized the industry in both interior and exterior construction work. These technical milestones made heavy physical work on construction sites not only considerably easier but also more streamlined. Since the acquisition of the "Brinkmann" brand in 2008 and relocation to the Aichtal branch in 2012, the company's market presence is now stronger than ever. Putzmeister extended its range of products with the development of concrete pumps in the 1960s. This time, unlike the market launch of mortar pumps, Putzmeister was not the "inventor" but was in competition with established manufacturers from the outset. Higher pressures, larger pump volumes and even concrete delivery were only possible, in Schlecht's opinion, if previous design principles were fundamentally questioned and new paths were taken. With the concept of a hydro-hydraulically driven two-cylinder piston pump combined with the flapper system (1969), Putzmeister, as a newcomer on the market, stirred things up for the established manufacturers. Having achieved the world record of 1,017 ft. (310 m) in high-rise concrete pumping at the Frankfurt telecommunications tower (1977), Putzmeister finally gained acceptance in the international construction industry. This was preceded in 1971 by the invention of a compression-proof transfer tube in conjunction with concrete pumps driven by hydraulic fluid. In 1997, Putzmeister purchased the Telebelt line and has been an industry leader in telescopic belt conveyors ever since. The Telebelt has set the standard for versatility and durability, placing 5 cu. yds. (4 cu m) per minute with ease. Today, Putzmeister develops and produces truck-mounted concrete pumps, Telebelt telescopic belt conveyors, stationary concrete pumps, Pumi truck mixer concrete pumps, stationary placing booms and accessories. 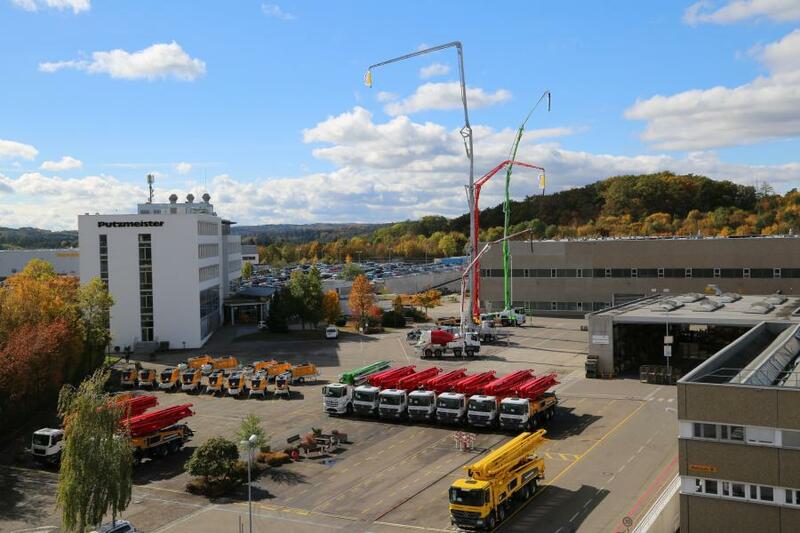 Putzmeister once again garnered international attention in 2017 with the new generation of truck-mounted concrete pumps in the 30-meter class. Staying true to the motto of "close to your business," feedback from customers across the world, as well as comprehensive test results from Putzmeister's research and development facility, were integrated into their development. Since 1977, Putzmeister has been using its expertise in pumping technology to pump other entirely different media too. Initially, the company just made series-produced concrete pumps, which were used to transport sludge from the Aswan Dam to land through floating pipelines, for example, or to transport earth excavated during tunneling works up to ground level. Putzmeister soon developed these machines further into powerful pumping systems for transporting high-density solids, systems which could be combined with special supply and metering devices, mixers, silos or discharge equipment. Typical fields of application for Putzmeister high-density solids pumps include mining and sewage treatment plants, as well as disposal plants for waste, biowaste and special waste. Putzmeister high-density solids pumps also undertake various delivery jobs in the cement industry, power stations, oil and gas industries, and in water treatment and for land reclamation along the coast. 1994: World record in high-rise concrete pumping 1,745 ft. (532 m) at the "Riva del Garda" power station, Italy. 1997: New world record in long-distance pumping with 6,611 ft. (2,015 m) in Le Refrain/France. 2007: New world record in high-rise concrete pumping at the Burj Khalifa in Dubai, UAE, with a height of 1,988 ft. (606 m). The total height of the building is 2,717 ft. (828 m). 2008: Introduction of a new truck-mounted concrete pump, placing boom of which reaches a height of 230 ft. (70 m) for the first time ever, another world record for Putzmeister. 2014: A new Guinness World Record for the largest continuous concrete delivery was set at the New Wilshire Grand Center in Los Angeles with 12 Putzmeister truck-mounted concrete pumps, two stationary booms and two stationary concrete pumps. The delivery totaled in 21,189 cu. yds. (16,200 cu m) in 18.5 hours. 2016: During the construction of the Geepas Tower in the UAE, a new Guinness World Record was set for achieving the world's largest continuous concrete delivery — 25,888 cu. yds. (19,793 cu m) in 42 hours. In addition to achieving numerous world records, Putzmeister also has rewritten technical history many times over through pioneering innovations and spectacular deployments. These include, for example, the pioneering work in developing large truck-mounted concrete pumps with flexible five- and even six-arm placing booms. In 1986, some of these long-reach boom pumps were specially equipped to withstand radiation and, running in non-stop operation, helped construct a protective shell of reinforced concrete around the atomic reactor after the accident at Chernobyl. For the huge project that was the construction of the Channel Tunnel (1988–1994), Putzmeister offered not one but two solutions: Firstly, especially powerful high-density solids pumps transported enormous quantities of excavated material from the tunnels to a landfill site. Secondly, the annulus between the tunnel liner segments and the surrounding mountain was concreted with special two-component mortar using computer-aided injection and filling systems. Putzmeister also has contributed to notable construction in the United States. One of the most recognizable bridges in the United States, the Hoover Dam Bypass project (2005-2010), required Putzmeister's complete systems approach for assistance in the selection and positioning of equipment for the many job site challenges. In the final stages of the project, Putzmeister detached a 52Z-Meter boom pump from its tractor to save flyweight and reduce the unit's footprint on a very cramped site. In 2010, Putzmeister delivered six Telebelts to the Panama Canal Third Set of Locks project. The equipment onsite needed to be able to adjust to a constantly changing terrain due to flooding, landslides, and unstable banks. In the presenting conditions early in the project, a Telebelt would deliver the reach and mobility necessary. As the locks moved forward, Putzmeister delivered 16 units from across the company's product range to aid in the successful completion of the expansion. Putzmeister has stood out with its innovations in the software area too, for example with the Ergonic EBC control system introduced in 2001. The simplified remote control enabled booms with several arms to be operated easily and safely from just one joystick. The latest generation of the Ergonic Control System, Ergonic 2.0 features new control boxes and panels, a centralized hardware and software in control unit, and a remote control that is interchangeable among all Ergonic 2.0 units. The radio remote control (FFS), is easy to handle and extremely lightweight. Due to its comfort, well thought-out menu, and ease of controlling the pump, this system is extremely popular among machine operators. Additionally, it features a large, high-resolution color display, offering a complete pump overview with clear readability. In 2018, 60 years after the company was founded, Putzmeister boasts a finely graduated range of products in the fields of concrete, mortar, tunnel and industrial technology.